When the poster artist Erik Bruun (born 1926) was given the job to attract passengers to the ferry traffic between Stockholm and Helsinki/Turku he put on his thinking cap. What about the trip is so appealing? He soon realizes the answer: A day of luxury. And what could be more luxurious that the smorgasbord? Salmon and mayonnaise and cognac and cigars – everything was there! 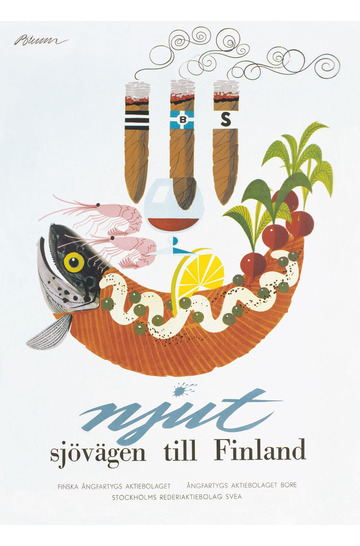 That’s why the smorgasbord became the symbol of the rising wealth in Finland after the war. 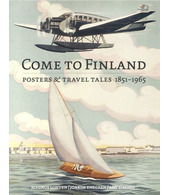 With the help of the poster even Germans were lured to the north to witness the Nordic wonder. But how to solve the tricky problem of getting all three clients’ trademarks neatly in one single poster? With cigars as funnels, of course. Nobody but Erik Bruun would have come up with that idea. Finland Steamship Company, Bore and Swedish Svea were back then called ”The ones that sail together”. In 1957 the cooperation was widened via the new daughter company Siljarederiet (later Silja Line), which today is owned by Tallink. Pst! Here comes a free advice for Tallink: Call for Erik Bruun again!